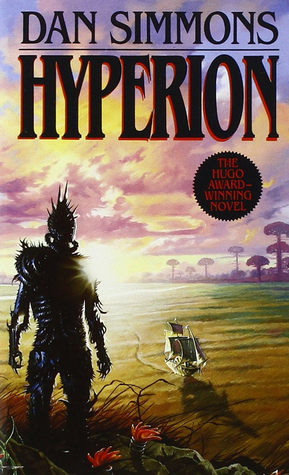 Finished Hyperion by Dan Simmons. I picked this up awhile ago after hearing good things about the series. And the author was born in a city near me, which was nice. This book is structured as a series of stories told by each of the characters. It begins as they gather for a pilgrimage to the mysterious Time Tombs on planet Hyperion. Each character in turn tells the tale of why they are on this trip as they progress on their journey. Reading the book took longer than expected. At the beginning, I found that I kept putting it down. Not that it was bad, however it does move a bit slow in the beginning. Once it was about halfway into the first character's tale it picked up. The book finishes with all of the tales complete, and the destination reached. Totally set up for the second book, The Fall of Hyperion, which I am excited for. Each character has a different style of story. There is the priest, Father Lenar Hoyt. His tale resembles that of a pulp novel jungle explorer who happens upon an indigenous tribe. Sol Weintraub, a man of Jewish decent. A story of tragedy, and probably my favorite of the bunch. His daughter was researching the Time Tombs, and after an event began aging backwards. Not only aging backwards, but each day's memories stripped away when she woke. After watching his 20-something daughter age into an infant, Sol joins the pilgrimage to Hyperion in hope of curing her. Colonel Fedmahn Kassad, a soldier. His tale is the most action packed out of the bunch. Martin Silenus, the poet. Best selling author in the galaxy, hedonist, and man who is extraordinarily old. Haunted by his muse, he is traveling to Hyperion to complete his greatest work. Brawne Lamia is a female private investigator from the planet Lusus. Her story reads like a cyberpunk noir detective tale. And finally "The Consul". A diplomat who tells a story of love and why he actually isn't was he appeared to be at the beginning of the book. I have the next book in my possession, and will start it after I have finished H.G. Wells Jules Verne's Journey to the Center of the Earth.